The Olympus Rally, based in Olympia, WA, marked the fourth round of the 2007 Rally America National Championship. Held only three weeks after the Oregon Trail Rally, the Olympus Rally is second of a string of three events leading to a six week summer hiatus. 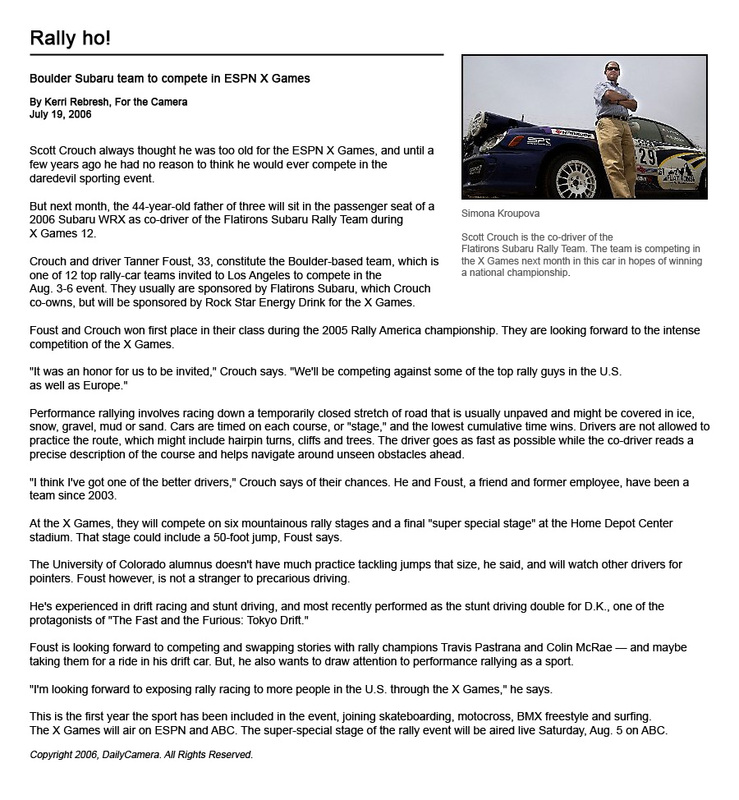 The 2007 event marked the first time competing at the Washington-based rally for the Flatirons Tuning Rally Team, as the rally made its return to the National Championship Calendar. "Olympus was going to be an important event for us. Even though we won Production GT at the last two rallies, we still weren't really sure where we were in terms of pace for the championship since at 100 Acre Wood we had new car teething problems before Matthew [Johnson 2006 Champion] crashed, and in Oregon we only went head-to-head on a few real stages with Matthew," stated Flatirons Tuning driver Stephan Verdier. He added, "We also really wanted to work on starting at 100% on the first stage so we wouldn't have to worry about trying to make up time later in events, something that we had struggling with at previous rallies." For the Flatirons Rally Team the Olympus Rally started off well, with class stage wins on two of the first four stages of the event. However, on Special Stage Five things began to take a turn for the worse. "Within the first mile of Stage Five, the intercom just went out. Scott tried to call the notes loud enough for me to hear so we could complete the stage and try to make repairs, but it was hard to listen to the notes and concentrate on driving without the intercom working. We missed a turn and stalled losing 20 seconds. On Stages Six and Seven we wanted to make up some of the time, but it was hard for me to concentrate after the problems on Stage Five; we ended up making a couple of mistakes and lost time on both of those stages," noted Verdier. The last three stages of Leg One were a repeat of five, six, and seven. "On the repeat stages we were within a couple of seconds of winning the class on every stage. It was good to see that when we were on our game we could be competitive for the championship. I think if we hadn't decided to compromise on our tire choice we would have been even faster on those stages," commented co-driver Scott Crouch. Scattered rain storms and overcast skies greeted the teams on the morning of Leg Two. After a brief Parc Expose in downtown Shelton, WA, the teams set out to complete the morning loop of stages. Despite finishing Leg One with competitive stage times the string of bad luck that had put the Flatirons duo out of first place in class returned on the first stage of the morning. "About half way through Stage 11 we started to lose turbo boost and had to switch the car to the low boost setting, giving up precious horsepower and losing time. On Stage 12 it became evident we had damaged our exhaust on some of the rough sections at some point and had an exhaust leak that was robbing us of power. Also a few miles into the stage we were forced to stop with electrical damage which caused the engine to shut down," stated Crouch. With the team's 2004 Subaru WRX's electrical system damaged, preventing the vehicle from running, the team was forced to withdraw from competition. Despite the disappointing result, the Olympus Rally marked an important step forward for the championship aspirations of the Flatirons Tuning Rally Team. "Obviously we are disappointed to not have been able to finish the event or make an attempt at a comeback, but we feel like we have made a lot of progress for the championship. Every event we are making strides towards developing the new car and getting better performance. As a driver I have been working really hard on trying to get up to speed as the competition in Production GT has really evolved while I was absent from the scene. We'll figure out what caused our electrical failure and continue to develop the rest of the car. We hope to be able to take the pace we showed on the first day's stages to the Susquehannock Trail Performance Rally and really battle for event wins for the rest of the championship; we still have strides to make with the car but we know we can be competitive and challenge for the overall championship," stated Verdier.